Rabbi at Nemirov, Russia; murdered May, 1648. When the hordes of Chmielnicki, taking Nemirov, began the work of pillage and massacre, a Cossack concealed Jehiel, hoping that the latter would show him where the Jews had hidden their wealth. A shoemaker, however, discovered Jehiel and his mother, dragged them to the cemetery, and murdered them. 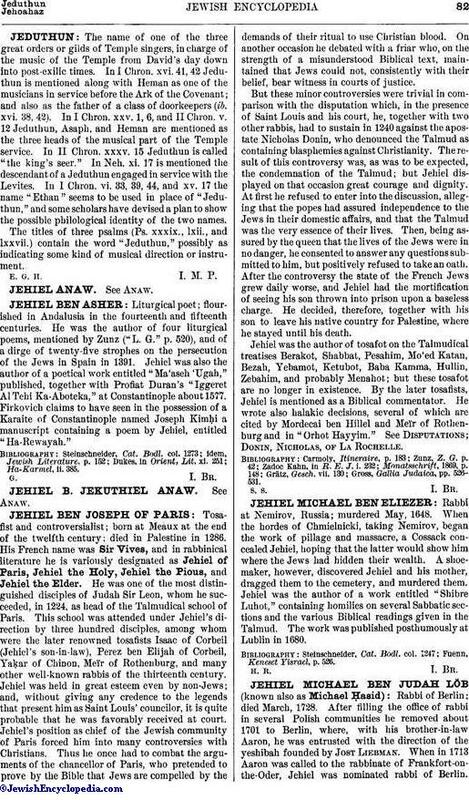 Jehiel was the author of a work entitled "Shibre Luḥot," containing homilies on several Sabbatic sections and the various Biblical readings given in the Talmud. The work was published posthumously at Lublin in 1680. Fuenn, Keneset Yisrael, p. 526.